It is sometimes difficult to compare stories told across different mediums. A folk-tale, memorized by poetry and passed down from generation to generation, has a different quality than a carefully composed play, brought to life by actors and music. A play feels different than a novel, wherein the limits of imagination are broader than the constraints of the stage. And a novel is distinct from a movie, which is so immersive that imagination is no longer even necessary. Plato famously complained of the dangers of the arts (meaning dramatic entertainment) in The Republic, and critics today are liable to be just as censorious; if not in the full legal sense, than at least in the cultural one. In all likelihood, most of everything ever made was garbage, and only the true quality survived the dissolving memory of time. And within all of these mediums, there were quality stories: among the ancient poems, there were the religious cannons — the Bible, the Bhagavad Gita, and Homer; of the plays, the works of Sophocles and Shakespeare; from the novels, Dostoyevsky, Joyce, and Tolkein; and among movies, we have such classics as The Godfather, Gone With the Wind, and Lawrence of Arabia. What makes these stories good? It is a difficult question, but a question for which, for the purposes of establishing a standard by which we can judge stories from a new medium, we can compose a relatively simple answer. A good story is one which is internally consistent, aesthetically pleasing, and archetypally true. Internal consistency is evidence of honesty on the part of the story-teller. Too many god-from-the-machine moments (sources of motion external to the story itself) or inexplicable changes in setting or character destroy any sense of cohesion in the story’s message. It makes the story feel confused, forced, or otherwise misleading. Some stories can even feel deceptive. A story is aesthetically pleasing where the form of the characters and the action are balanced, and make sense in the context of the setting. It is a kind of visual internal consistency, but one which makes the action immersive and enjoyable, as well as believable. However, many stories are both internally consistent and aesthetically pleasing without being “good.” They may be pleasing, but they aren’t often remembered for centuries or millennia after the creator has died. A story must be archetypally true for it to have a chance of acquiring that status. Archetypal truth is achieved when the forms of the characters, events, and settings, are congruent with the deeper patterns that make up human existence. If a character wins the lottery, then battles an alien and effortlessly wins, then gets married to three women, and then suddenly dies for no reason, it doesn’t resonate because the pattern called “obscene luck, glorious fight, unreasonable sexual fulfillment, sudden death” is not a familiar one to most people. It is not archetypally true. The world is not like that, even metaphorically. We call this story ‘man in a hole,’ but it needn’t be about a man, and it needn’t be about somebody getting into a hole (but it’s a good way to remember it). Somebody gets into trouble. Gets out of it again. People love that story! They never get sick of it. They never get sick of it because people fall into holes and get out of them again, all the time. It’s also an encouraging story, though we also love sad stories, so long as they are archetypally true. Good horror films and tragedies draw audiences time and again. So what about video games as a medium for story-telling? We’ve seen all sorts of attempts at this over the years, and truth be told, I am not experienced enough with video games generally to state which particular games tell the best and the worst stories. But there is one example I’m familiar with that serves as an excellent demonstration that the medium can be used to tell a story that is not only internally consistent and aesthetically pleasing, but archetypally true as well. That game is Elder Scrolls V: Skyrim. To qualify as “good,” let’s get the basics out of the way. Skyrim maintains a coherent story with previous games in the series, as well as within itself (unlike other continuations of epics we saw earlier this year), and the setting is vast and immersive, as well as beautiful. So 2/2 on those fronts. It is in the world of archetypes that Skyrim starts to get really interesting. The story seems to begin in a town called Helgen, where the hero is being transported as a war-prisoner along with a number of rebels. The rebels call themselves the “Stormcloaks,” and their leader, Ulfric, happens to be among the captured. It seems that the war is over, and indeed, the game seems about to be over too, as the headsman puts your neck on the block, when the entire episode is interrupted by… a dragon. It’s a call to adventure. Joseph Campbell composed the theory of the monomyth — also known as the “hero’s journey” — as an explanation for the similarities across mythological systems and heroic epics around the world. According to his research, all the great stories followed a particular narrative pattern, which was contained inside the monomyth. Not all of the stages need to be present for a story to follow the monomyth, so long as the general trajectory of the story is followed. Let’s return to Skyrim and see how closely it follows the plot. The fiery call to adventure in Helgen is, incidentally, also an attempted murder, which is a frequent preliminary stage. We can call it a sub-step in the monomyth. After running through the blazing town, the protagonist meets either with Hadvar or Ralof, who serves as a guide through the dungeons and tunnels beneath Helgen’s keep. After escaping the tunnels, the protagonist is sent on a number of quests. These quests all aim to acquire objects, find people, and learn valuable information, all about how and why dragons have returned to Skyrim, yet they also serve to hone the protagonist’s skills and test his abilities. They are — in many instances literally — a road of trials. After slaying his first dragon, the protagonist learns that he is “dragonborn,” meaning he has the soul of the dragon, and has uniquely attuned to the ways of dragons from birth. He learns that there have been others in Tamriel (the continent of which Skyrim is the northern edge) who were dragonborn, and that they have the capacity for immense power, if they learn to develop and control it. Going forth, the hero — for he has slain a dragon now — begins learning how to use the power of the voice — the “thu’um” — from reclusive monks known as the Greybeards. This is a recursive return of step 2, but it is also a revelation that the hero was born under extraordinary circumstances — another monomythic sub-step. Eventually, the hero learns that he must meet the leader of the Graybeards in order to discover how he can defeat the great dragon, Alduin, who attacked in Helgen and has been bringing other dragons back from the dead. After being taught a special shout by the Greybeards that will allow him to clear the weather, the hero is able to ascend to the peak of the tallest mountain, on which the Graybeard’s temple — High Hrothgar — is located. The leader of the Greybeards, Paarthurnax (incidentally a dragon himself) informs the hero that Alduin has come back now, after all these generations, because Alduin was sent forward in time by human warriors of the past. He was banished in this manner, by no coincidence, from the peak of the Throat of the World on which the dragonborn stands. This makes the Throat of the World not only the highest peak in the game (symbolically analogous to the high peaks of the Gothic Cathedrals, reaching skyward towards God), but also both the real beginning of the story, as well as the end. It is, in other words, the axis mundi, the cosmic axis paralleled by the Cross (which mirrors the tree of the knowledge of good and evil) in Christianity, Yggdrasil in Nordic paganism, Olympus in Greek paganism, and the Bodhi tree in Buddhism. 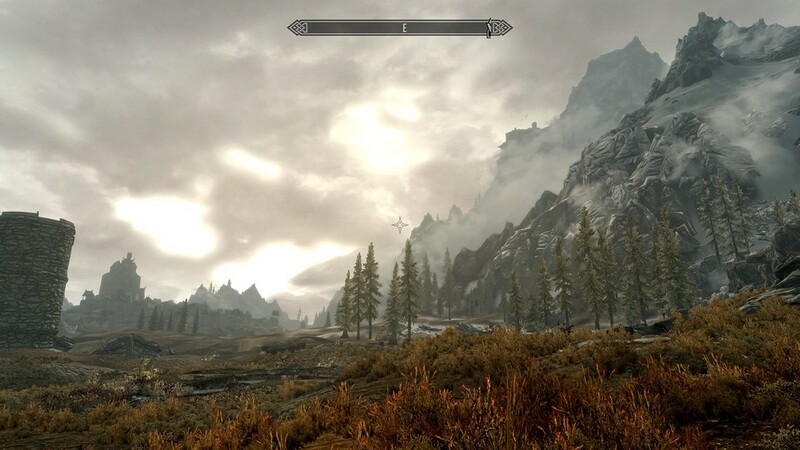 By arriving at the time-wound at the top of the Throat of the World, the dragonborn has crossed the threshold. If this seems like an interpretive stretch, consider the very name “Throat of the World,” in the context of a game in which the “divine power” is that of the voice. Thumos is a Greek word expressing the concept of “spiritedness” (as in “spirited stallion,” or “spirited debate”).The word indicates a physical association with breath or blood and is also used to express the human desire for recognition. I had a fixed purpose when I put to sea. or meet my death herein the mead-hall. Whose mead-hall was Beowulf protecting, a thousand years before Bethesda released Skyrim? Why the mead-hall of King Hrothgar, of course, originator of the name of the temple that houses the Graybeards. 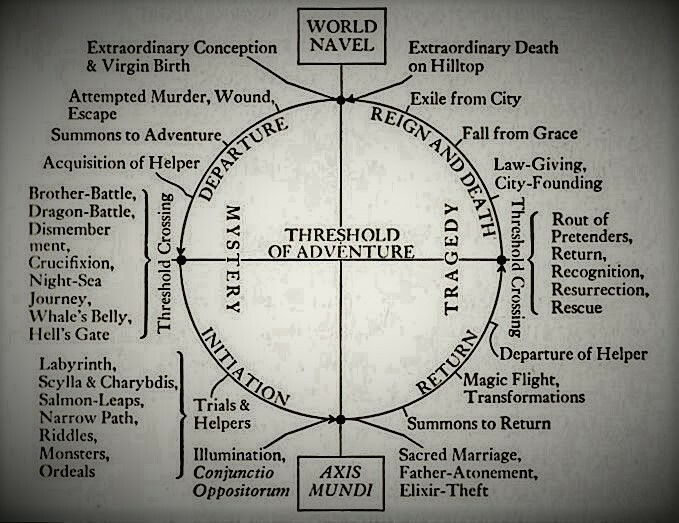 If this theory of the Hero’s Journey still seems reaching, and like mere coincidence, Bethesda even included an in-game book titled The Monomyth, which can be found in High Hrothgar (among other places). Continuing on our journey, the dragonborn reads an elder scroll (magical assistance) in order to learn the shouts necessary to do battle with Alduin. Sensing something important, Alduin promptly appears and does battle with the dragonborn, who is aided by Paarthurnax. Although defeated, Alduin is not killed, and retreats into Sovngarde — a heavenly land of the dead modeled closely on the Nordic Valhalla. The hero learns that he intends to regain his strength by devouring the souls of the dead. There is no way for a mortal to get to Sovngarde. There is only one portal, and it lies in a place called Skuldafn, which only the wings of a dragon can reach. Working with the local Jarl, the dragonborn induces a fight with a dragon named Odahviing, whom the dragonborn does not kill, but captures in the great hall of Whiterun. In defeat, Odahviing speaks to the dragonborn with respect. He reveals that many of the dragons have begun to question Alduin’s leadership, and offers to fly the dragonborn to Skuldafn if the dragonborn will free him from the trap. The dragonborn accepts, and releases Odahviing. The dragon represents the ancestor of the dragonborn’s own soul, yet their relationship is — to put it mildly — strained. The dragon wars have once again pitted men against dragons, and so it takes a man with the soul of a dragon to put an end to the war, and this can be done by reuniting the estranged father with the son. Dr. Jordan Peterson describes this pattern clearly in the story of Pinnochio, where the half-jackass Pinnochio must literally go into the belly of a whale — Monstro — in order to save his father, whom he had spent essentially his whole life disobeying. But it’s only half about saving his father: saving his father is also about his own heroic journey, about saving the world and himself. Which brings us back to Skyrim. Speaking of enormous beasts, whatever happened to the belly-of-the-whale moment for the dragonborn? In most stories, the “belly of the whale” is represented by a cave, an underworld, or the dark and dangerous depths lying near the heart of the enemy, which is the hero’s shadow. In Skyrim, the belly of the whale is Skuldafn, Alduin’s sanctuary, and the bastion of his last and most powerful followers. Isn’t the “belly of the whale” supposed to happen before the reunification with the father? Not necessarily, but in this case it actually does work out in that order. Odahviing saves his final words of reunion until after he has delivered the dragonborn to Skuldafn, promising to assist the hero if ever he is needed. Having entered the belly of the whale, and with the reunion complete, the dragonborn sets off alone towards the portal to Sovngarde. Here, death is synonymous with the abyss, as confrontation with Alduin (the abyss) will take place in the land of the dead. Approaching the portal to Sovngarde is the approach to the abyss, and is the final trial before the confrontation with the Shadow. It is an important stage because the gravity and the seriousness of the endeavor is fully felt. Many heroes in other stories becomes overwhelmed at the approach, and cave in to fear, despair, or conversely, to overconfident pride at this stage, and either whither away or are crushed. The only way to survive the approach is to lose yourself. The necessary death of the hero is not a literal event, although in mythology it is usually portrayed in this way. Rather, the hero must lose his ego and become a new kind of being. Whether this is a boy becoming a man, a caterpillar transforming into a butterfly, or a heathen man becoming a Christian, in all cases the old identity dies to make room for something new. After the dragonborn passes through the portal and wanders towards the Hall of Valor, a guardian named Tsun challenges the dragonborn, asking him by what right he requests entry. Although the game allows for different responses to Tsun’s challenge, all of them justify the dragonborn not by given name (the ego), but by role (either as the dragonborn, or as the leader of one of the many factions in the game). This is the culmination of the hero’s acceptance of his destiny: it is a role that existed before him, and will exist after him, and is therefore too great for an individual as such. It is not too big for a hero however. These identities are like masks that can be put on and participated in. They provide great reward and great enjoyment, except the individual must sacrifice themselves in the endeavor. A man can become a husband, but he must give up the enjoyments of life as a bachelor. In this way, the hero of Skyrim gives up being [given name] and truly becomes Dragonborn. This is his ordeal resulting in death. After entering the hall and speaking with the ancient warriors who banished Alduin in the first place, the dragonborn once again squares off against Alduin. This time, he dies. Closer examination of the dark characteristics — that is, the inferiorities constituting the shadow — reveals that they have been an emotional nature, a kind of autonomy, and accordingly an obsessive or, better, possessive quality. Emotion, incidentally, is not an activity of the individual but something that happens to him. Affects occur usually where adaptation is weakest, and at the same time they reveal the reason for its weakness, namely a certain degree of inferiority and the existence of a lower level personality. On this lower level with its uncontrolled or scarcely controlled emotions one behaves more or less like a primitive, who is not only the passive victim of his affects but also singularly incapable of moral judgment. Let us suppose that a certain individual shows no inclination whatever to recognize his projections. The projection-making factor then has a freee hand and can realize its object — if it has one — or bring about some other situation characteristic of its power. As we know, it is not the conscious object but the unconscious which does the projecting. Hence one meets with projections, one does not make them. Alduin wahlaan daanii. His doom was written when he claimed for himself the lordship that properly belonged to Bormahu — our father Akatosh. This is the goal of the hero as such, and it represents the peak of the action, although it is not quite the end of the journey. For the dragonborn’s story to conclude, he must return to the land of the living. This is decision is made easier for the player by the relatively sparse options allotted to the player in Sovngarde. On the whole, it seems to be a relatively boring place, and the wonder of speaking with the glorious dead, and basking in victory over Alduin, quickly become tiring. Easier still, Tsun simply teleports the player back. There is no fantastic chase, no dangerous enemies to evade, nothing of the kind that often accompanies heroic stories (though rarely as challenging as the trials, the approach, or the ordeal). In any case, Skyrim still has other problems to address, and resting on one’s laurels is not the heroic thing to do. Like Zarathustra, the dragonborn must come down from the mountain of success, achievement, and glory, and live life again in the land of the living, as a mortal. Despite being superficially attractive, the alternative is not rewarding in the way that heroism is. And where does the dragonborn return to? See if you can guess. The answer is here. This leaves the last and final step: the bestowment of new life. The dragonborn’s return is greeted by Paarthurnax and a host of dragons who acknowledge the dragonborn’s Thu’um as stronger. This represents the proof that Alduin’s power is entirely gone… presuming the hero is not himself going down the path of Alduin, of course. How meaningful is this kind of “life,” really? It is powerful enough to reach out of the game and into our world. Just this song has been covered by all sorts of artists, including YouTubers hitting 470,000 or 3,700,000 views. It has been covered orchestrally, as well as on the radio. One rendition, which hit over 21,000,000 views, was worked into a mod in place of the real version in the game, but even this did not top Lindsey Stirling, whose cover presently sits at over 70,000,000 views. And of course, there is the mandatory metal rendition. Skyrim, and the exploits of the Dragonborn, strike a chord with people. Sometimes several at once. And these chords themselves constitute a cultural life that transcends the life of an individual. the judgment of a dead man’s life. Even self-improvement afficianados like The Golden One aren’t immune, despite being generally concerned about the way video games can be used as an escape from reality. Why does he make an exception for games like Skyrim? Because they are inspiring. They are epic stories, they are good stories, and they make us better versions of ourselves, just as the good poems, plays, novels and movies can make us better. Just as Plato did not in fact attack all art, but only pointed out some of its dangers and advised discernment in choosing quality art, so too should the level-headed gamer be discerning, and be mindful of the way in which video games can steal away both our time, our money, our energy, and even our values if we are not careful (just like trashy romance novels and B-grade action-flicks). There is one final point worth pondering, and that is the qualitative difference between movies and video games. Unlike the silver screen, video games are participatory. What moral implications might this distinction hold? The moral value in oral, performed, written, or visual arts is akin to visualization. We envision ourselves in the place of the protagonist, and are vicariously walked through certain archetypal paths. This path may be heroic — i.e., the protagonist makes the correct decisions in the face of challenges, and reaps the rewards. Or it may be tragic — i.e., the protagonist makes a mistake, and then, through a moment of recognition ( ἀναγνώρισις, “anagnorisis”) learns a new truth about life, thus grasping a kind of bitter but immortal victory from the jaws of total mortal defeat. In either case, the audience must empathize, and imagine themselves in the place of the protagonist, at least self-consciously. Only in doing so can the story serve as moral practice for following the heroic procedure, and for identifying and avoiding tragic errors. Video games that embody archetypal truths do not require the audience to visualize their place in the story for this practice, because the audience is performing the actions themselves. This seems to pose an interesting trade-off: will the decreased requirement for empathy in narrative lead to an actual decrease in human empathy? Will the participatory nature of video games make the practice for virtuous living in good games more effective than the more psychologically distant forms of story-telling? And will the converse participation in unvirtuous living in bad games have a corollary effect? There is very little conclusive research on this, but there is likely some degree of truth to all three of these hypotheses. In the end, the prevalence of logical consistency, aesthetic beauty, and archetypal truth in games like Elder Scrolls V: Skyrim mean that as a medium, video games have the capacity for high art, of the variety that uplifts the soul and makes us better people. So in moderation, and with discernment, play away. Just don’t forget to come down from the mountain.